Cambodia, officially known as the Kingdom of Cambodia, is a country in Southeast Asia. The country is under a constitutional monarchy, and is ruled by Hun Sen, who has been the head of the government of Cambodia for the past 25 years, establishing himself as the longest serving non-royal leader in South East Asia. With these 58 interesting facts about Cambodia, let’s explore more about its history, culture, people, politics, Khmer Rouge, Angkor Wat, etc. 1. Theravada Buddhism, which is practiced by approximately 95 percent of the population, is the official religion of Cambodia. The religion is also practiced in Sri Lanka, Burma (Myanmar), Thailand and Laos. 2. This branch of Buddhism (Theravada Buddhism) follows the teachings of the Tipitaka or Pali Canon, which is a collection of the oldest recorded texts of Buddha’s teachings. There are more than 100 million Theravada Buddhists today. 3. Evidence from carbon dating suggests that Cambodia was inhabited as early as 4000 B.C. 4. Did you know that recently, multiple cities between 900 and 1,400 years old beneath the tropical forest floor, some of which rival the size of Cambodia’s capital, Phnom Penh, were revealed by the cutting-edge airborne laser scanning technology? 5. Archeologists say that there is also a massive city beneath Mount Kulen. 6. In Cambodia, millions of land mines were planted during the war years. There is a land mine removal trust in Cambodia that is operational today, which assists in the removal of the mines, making the country safer. 7. Rice is considered to be the first crop that was grown on Cambodian soil since before the first century, AD. 8. A Pepsi bottling plant in Battambang, which began its operations in the 1960s, was forcefully shut down in 1975 during the Khmer Rouge’s control of the country. Today, the building is no longer standing. 9. Until 1953, Cambodia was a protectorate of France. 10. In Cambodia, genocide (the systematic killing of people on the basis of ethnicity, religion, political opinion, social status, etc.) was carried out by the Khmer Rouge (KR) regime between 1975 and 1979, killing at least one and a half to three million people. The genocide came to an end when Vietnam invaded Cambodia. 11. The bodies of the people that were killed in the genocide were buried in the “Killing Fields.” The term Killing Fields was coined by the Cambodian journalist – Dith Pran – after he escaped from the regime that led to the killings of so many Cambodians. 12. Cambodia is also home to the first of its kind – “the Killing Cave” of Phnom Sampeau. The cave has the bones of the doctors, teachers, men, women and children killed by the Khmer Rouge. 13. There is a small carving of a dinosaur on the walls of a temple at Ta Prohm. The carving might be an indication that dinosaurs lived on much later than originally thought. However, there is no concrete evidence for this assumption. 14. There is a “blind clinic” in Cambodia where you can receive massages from blind people. These people are trained in the art of massage so that they can make their living. 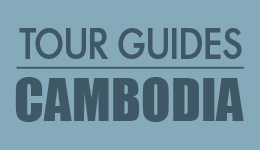 An estimated 1% of Cambodia’s population is blind. 15. During the Vietnam War, the U.S. also bombed Cambodia from 1963 until 1973. 16. Cambodia is one of the fastest-growing economies in Asia with an average growth rate of more than 6% in the last ten years. 18. 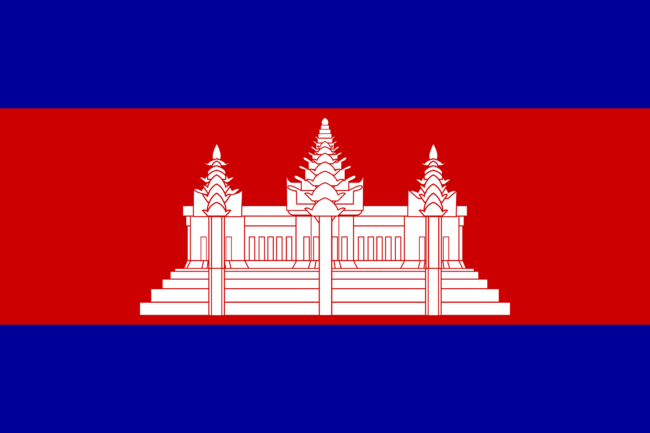 Kids take note that apart from Afghanistan’s national flag, the national flag of Cambodia is the only other national flag in the world to incorporate an actual building on it. 19. Despite Cambodia being one of the poorest countries in Asia, it received a whopping 4.5 million visitors during 2014, and an estimated two million every year since 2007. Clearly, tourism is playing a vital role in helping the economic growth of the country. 20. The garment and footwear sector in Cambodia is also among the top sectors that support the nation’s economy. More than 600,000 Cambodians are employed in these two sectors, the majority of whom are women. 21. It is a harsh fact about Cambodia that more than two and a half million people in the country live on less than $1.20 per day. 22. The present king of Cambodia, His Majesty King Norodom Sihamoni, is a bachelor and does not have children. Thus there is no direct successor to the king in case one is required to be crowned as the next king of Cambodia. On October 14, 2004, Majesty King Norodom Sihamoni was elected unanimously by the members of the throne council as King of Cambodia. He was born on Thursday, May 14, 1953, in Phnom Penh. 24. The Tonle Sap is also the largest salt water lake in Southeast Asia. 25. Cambodia is losing forests very fast. The rate of deforestation in Cambodia is one of the highest in the world. According to some estimates, between 1990 and 2005, the country has lost almost 25,000 square kilometers of forest. The main reason behind this heavy deforestation is the illegal cutting of the forest by smugglers for monetary gains from the valuable timber. 26. Hun Sen, Cambodia’s present Prime Minister became the world’s youngest head of the state when he was 32 years and 162 days old. 27. He has ruled Cambodia for more than 25 years and vows to continue his regime as the Prime Minister until he is 74. However, the ruler is said to have maintained his position in the government by oppression and violence. 29. The country is also among those that have one of the most corrupt governments in the world. 30. China and the U.K are the largest foreign investors in Cambodia. 32. The Communist Party of Kampuchea (CPK), also known as the Khmer Rouge, gained control of Cambodia on April 17, 1975. However, the party’s existence was kept a secret until 1977. 33. Pol Pot (real name – Saloth Sar), also touted as one of the world’s most infamous dictators, was appointed as the party’s secretary and leader in 1963. 34. The aim of the party (Khmer Rouge) was to establish a classless state with a rural agrarian economy. 35. During the party’s rule, human life was disregarded; and repression and massacre prevailed on a massive scale. Nearly two million people died during the period between 1975 and 1979. 37. As many as 300,000 people in Cambodia were killed as a result of the bombing, which the Khmer Republic government did with assistance from the U.S. Many people who suffered from the bombing joined the Khmer Rouge. 38. In an attempt to transform Cambodia into a rural, classless society, public schools, pagodas, mosques, churches, universities, shops and government buildings were shut or turned into prisons, stables, re-education camps and granaries. There was no public or private transportation, no private property, and no non-revolutionary entertainment. Public gatherings and discussions were banned during the period. 39. The KCP, soon after getting hold of the country, arrested and killed thousands of soldiers, military officers and civil servants from the Khmer Republic regime led by Marshal Lon Nol. 40. Known as S-21, the most important prison in Cambodia held almost 14,000 prisoners, only 12 of whom survived. The Khmer Rouge was responsible for the detention, interrogation and execution of these many prisoners. 41. In what is believed to have been the most brutal rule in the history of the world, Cambodians at that time were forced to grow at least three tons of rice per hectare throughout the country. The consequence of this torturous punishment was that the civilians had to work (forcefully) more than 12 hours a day throughout these years without adequate food and rest. 42. Angkor Wat is the world’s largest religious monument, covering an area of 162.6 hectares. 43. The temple was built by the Khmer King Suryavarman II in the early 12thcentury. 44. The temple was initially a Hindu temple. However, gradually it got transformed into a Buddhist temple by the end of the 12th century. 45. Angkor Wat means “Temple City” or “City of Temples” in Khmer. 46. A Portuguese monk – António da Madalena – one of the first Western visitors to the temple, said that it “is of such extraordinary construction that it is not possible to describe it with a pen. 47. Almost half of the international tourists coming to Cambodia come to visit the Angkor Wat. 48. The temple, unlike various other temples in its vicinity, faces the west – a direction that is associated with death. The norm at the time was to build temples pointing east. 49. The exact reason for such orientation by the builders of the temple is yet unknown. However, generally, the structure is regarded as a funerary temple. 50. The temple has been declared a UNESCO World Heritage Site since 1992. 51. The temple is undergoing restoration work. Most of the restoration work is sponsored through foreign aid. And only about 28% of the revenue generated from the sale of tickets to visitors is spent on the temple’s restoration work. 52. The temple also featured in the movie “Tomb Raider.” The movie’s production house was charged $10,000 per day for seven days of filming there. 53. There are 1.3 million mopeds in Cambodia for a population of over 1.5 million people. Thus, you can find mopeds almost everywhere you find people in the country. 54. KFC, the American fast food giant is losing money in Cambodia, which is the only country where they are not profitable. There are only 6 of these fast food centers in Cambodia. Surprised? Cambodia also does not have McDonalds (nor does Ghana and Yemen). 55. An estimated four million land mines are still to be cleared from Cambodia. 56. Cambodians do not celebrate their birthdays. Many older people do not even know how old they are. 57. Cambodia has a young population. Most of its population is under 20 years of age. 58. Funerals are quite expensive in Cambodia, and one may cost an average of $9,000. The procedure typically lasts more than 49 days, and the body is preserved for the first seven.